Without further ado, here are a few of the images that we had intended to present, with generous permission of the owner, who is aware that our wide range of interests about scripts, texts, written sources might gather a broad range of spectators and experts. 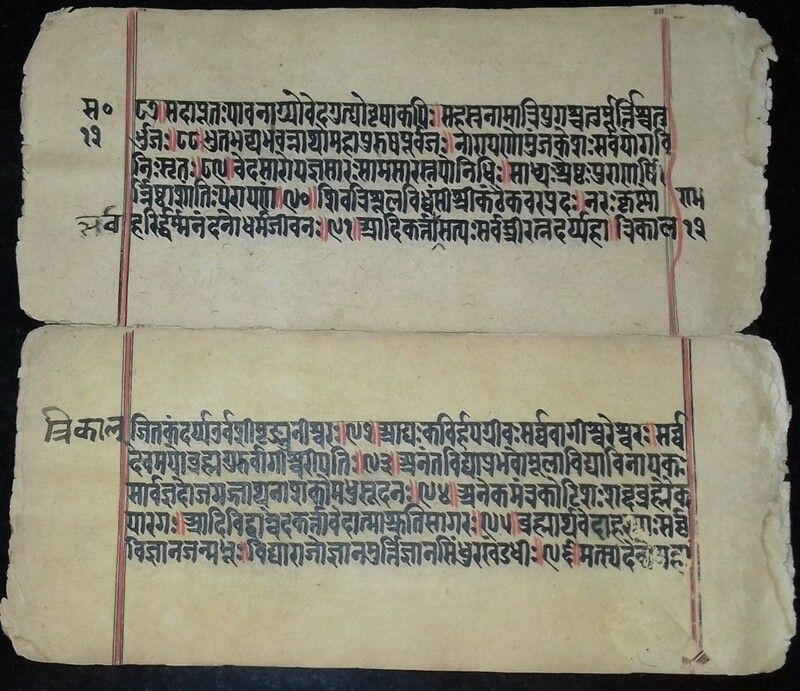 The samples represent Sanskrit and Jain manuscripts of various ages and texts. Their leaves stand on palm-leaf or on paper. Some have illustrations and decorative features. Their texts comprise single columns of long lines, bordered by vertical bounding lines and/or contained within rectangular frames. Some leaves have centered holes, circular or ovoid in shape, inset within the text, for stringing in a group as a unit. Other leaves have no such holes, but some such leaves include decorative, non-functional ‘stringing holes’. Rendered in red pigment (sometimes with embellishments in ink), their centered circular or similar elements emulate stringing holes, without such functional characteristics. Occasionally, similar red circular elements stand in the margin or both margins, at about mid-column height flanking the ‘stringing hole’. Some sources of information, among many, offer points of reference and information about the range of materials, languages, and texts. 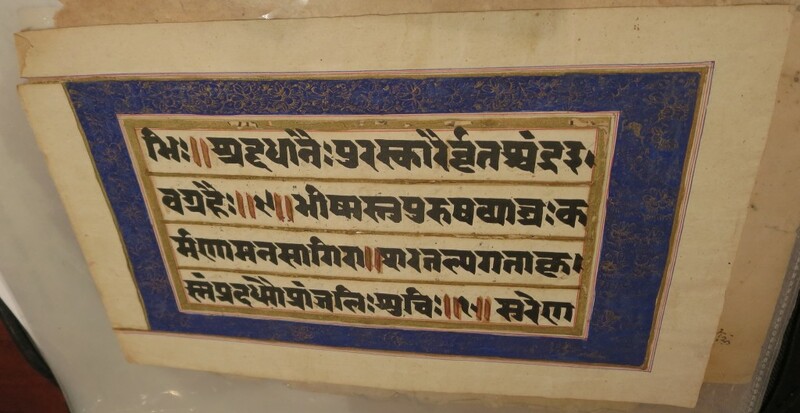 Sanskrit Manuscripts in the South Asian Rare Books Collection at the Library of Congress, Washington, D.C.
All the images are reproduced by permission of the collector. Captions and descriptions arise, as our tasks and access to expertise permit. We welcome your suggestions and information. The single column of 7 long lines is bounded by a pair of narrow double bounding lines, which extend the full height of the extant page. The text and bounding lines are monochrome, rendered in black ink. The date appears in the second-to-last line of text on the page shown here. 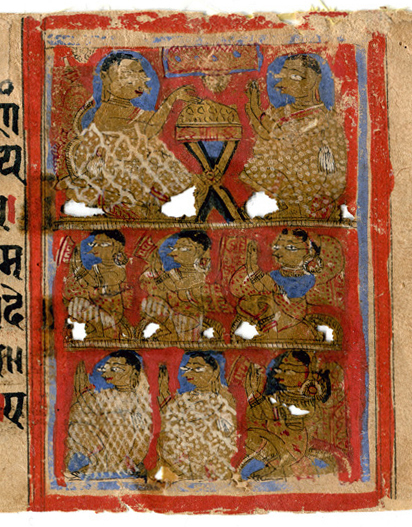 Among the various luni-solar dating systems employed in the Hindu Calendar, this version represents the Vikram Samvat (= VS), or “Vikram Era”. Purchased from an online seller. 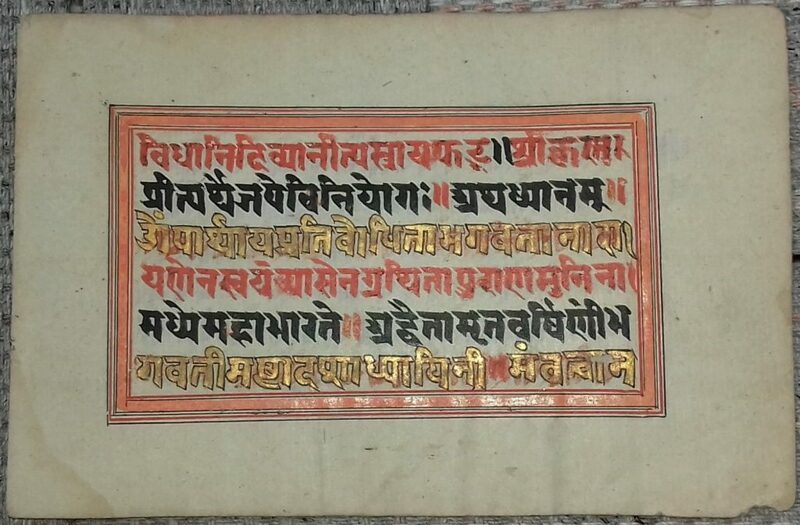 Hindu Manuscript on Paper, dated VS 1646 / AD 1589/90. Private Collection, reproduced by permission. The single column of 7 long lines is bounded by a pair of bounding lines, which extend the full height of the extant page. The bounding lines take the form of a band edged with ink contours and filled with red pigment. Offset towards the left, the ‘stringing hole’ comprises a circle filled with red pigment. 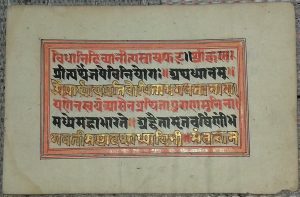 Presenting the biographies of the Jain Tirthankaras, this text is traditionally held to have been composed by Bhadrabahu I. 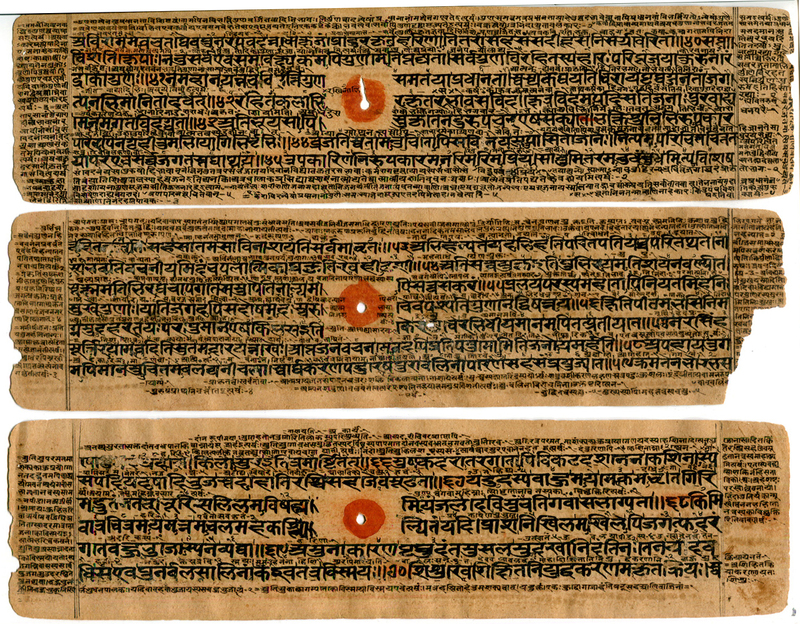 The oldest surviving copies of the Kalpa Sūtra, written on paper, were made in Western India in the 14th century. From the mid 15th-century onward, copies often — as here — have illustrations of scenes. Western India, Gujarat or vicinity. Purchased in the Portobello Road Market, London. On this side of the leaf, the red ‘stringing hole’ is accompanied by a matching pair of red-filled circles which stand in the margins. Standing to the right-hand-side within the column of text, and set within a band-like rectangular border filled with red pigment, the illustration comprises 3 tiers. Each contains 2 or 3 part- or full-length stylized human figures with faces turned in profile or three-quarter view. Leaf on Paper. The single column of 14 long lines is bounded by a pair of red-filled band-like bounding lines, which extend the full height of the extant page. More-or-less centered within the column, the ‘stringing hole’ comprises a more-or-less circular element filled with red pigment. Leaf on Paper, Western India, Circa 1500. Private Collection, reproduced by permission. The single column of 5 long lines contains a broad ovoid stringing hole, offset towards the left. The text presents a portion of the Bhagavadgita, Chapter 2, Verses 21–29. Purchased online from a seller in the U.S.A. The single column of 9 long lines is bounded by a pair of band-like bounding lines, which extend the full height of the extant page. The irregular ovoid stringing hole is offset to one side within the column. Annotations in the form of commentary or diagram appear within some margins. The manuscript is incomplete, lacking a colophon. Its text appears to be astrological. 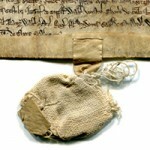 Purchased online in 2 groups of leaves, which amount to a substantial part of the manuscript, albeit incomplete. The manuscript is old enough to have functional stringing holes, rather than solely decorative ones. The style of writing appears to be Jain. 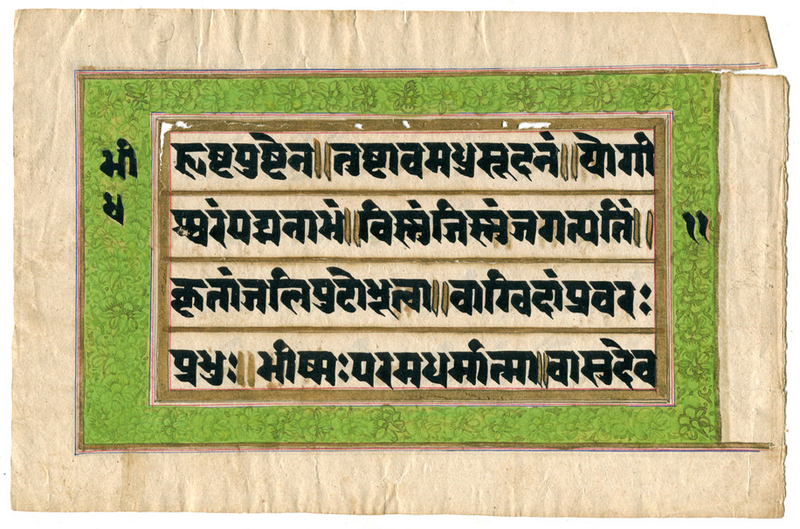 A quick guide to the sort of script is offered by Omniglot: Devanagiri (देवनागरी लिपि). 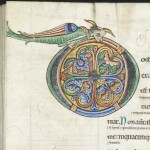 Examples digitized by the Cambridge University Library appear here. The single column variously of 7 or 6 long lines is bounded on only the left-hand side by an outlined band-like set of bounding lines, which extend the full height of the extant page. The pages shown here, in a single image, are out of order textually. Both have portions of the Devi Mahatmya or Devi Mahatmyam (Sanskrit: devīmāhātmyam, देवीमाहात्म्यम्), or “Glory of the Goddess“), a Hindu religious text describing the Goddess as the supreme power and creator of the universe. 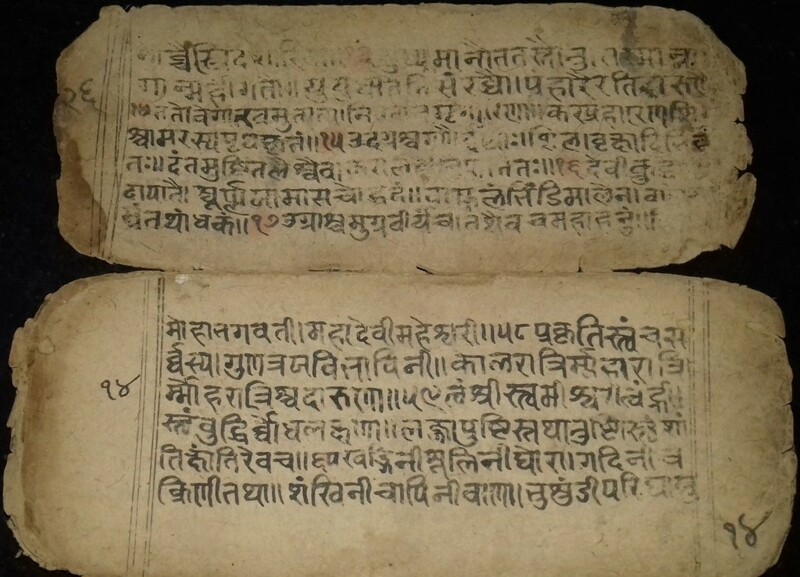 This text, believed to have been composed in in Sanskrit between 400–600 CE, comprises chapters 81–93 of the Mārkandeya Purana, one of the early Sanskrit Puranas, taking the form of a set of stories related by the sage Markandeya to Jaimini and his students — who appear in the form of birds. Here the upper page shows parts of Verses 83:13–18, while the lower page shows Verses 81:58–61. 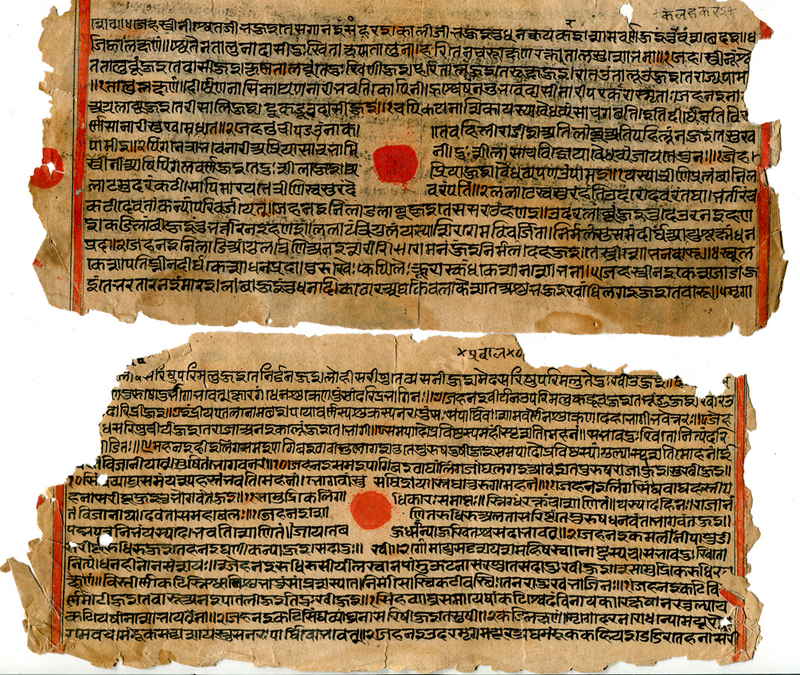 Mahatmyas are frequent features of Puranic texts. They are later compositions which were added to the original Puranas, so as to impart to the Mahatmya greater religious authenticity and validity. Mahatmya texts are eulogistic, composed to extol the holiness of particular divinities and/or localities as figures/places worthy of pilgrimage. These texts also describe the great benefits conferred upon the devotees who follow the mahatmya’s instructions for pilgrimage and worship. 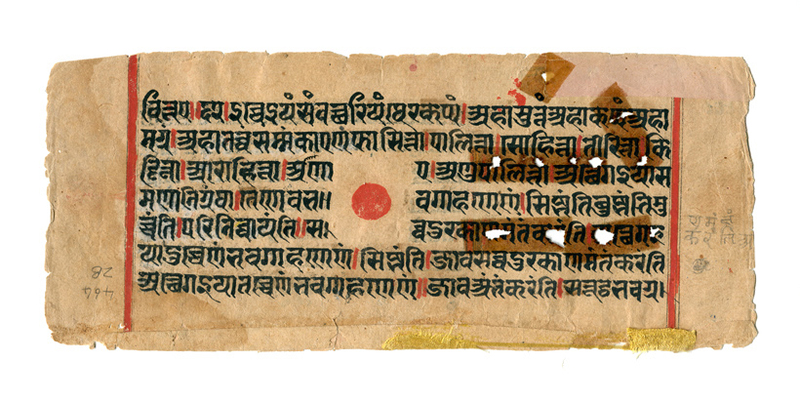 Fragment of a manuscript on paper in Sanskrit. Private Collection, purchased online. The single column of 5 long lines is bounded by a pair of band-like bounding lines, irregularly filled with red pigment, which extend the full height of the extant page. Where the lines of text do not remain within the preset confines of the bounding lines, but extend within or beyond them, the red pigment infill obliges by adopting an undulating course around their span. The text belongs to the Vishnusahasranamastotra, or Vishnu Sahasranāma stotra, a text or hymn (stotra) listing and describing the many attributes and epithets (sahasranāma) of the god Vishnu. These pages show verses 57–66. The 4-line column of text in long lines stands within an elaborately ornamented frame. 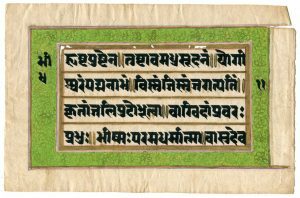 On each side of the leaf (which survives in fragile condition), the gold-framed rectangular frame enclosing the column of text encloses a continuous border. The border presents an intricate, frieze-like series of compacted floral designs painted upon a colored ground. 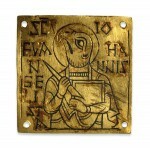 The designs are rendered respectively in gold pigment upon bright blue background (on the recto) or dark green pigment upon bright green background (on the verso). The grid- or ladder-like frame enclosing the column of text introduces horizontal bands (or rungs) within which each line of text hovers or (for the last line) stands. 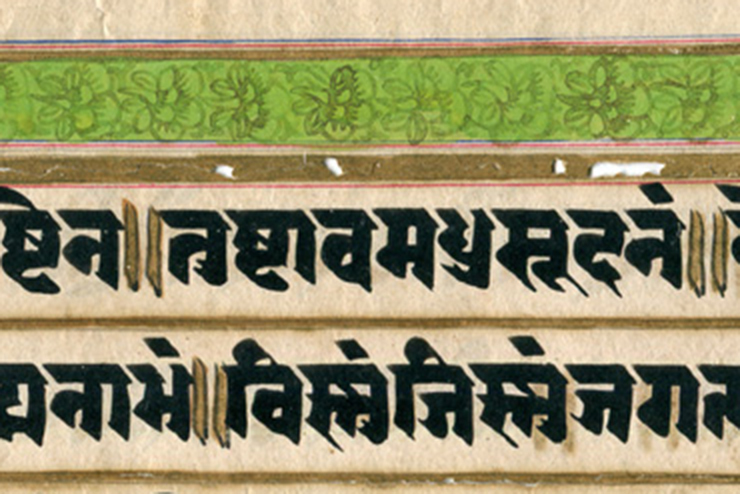 The text comes from the Bhīṣma-stava-rāja (भीष्मस्तवराज), chapter 47, of the Śānti Parva, twelfth and longest among eighteen books in the long epic poem Mahābhārata. It represents a hymn of praise of Kṛṣṇa by Bhīṣma. The text here corresponds to verses 6-9 of the recension transliterated by Muneo Tokunaga: here . Online facsimiles of witnesses to the text include University of Pennsylvania, MS Coll. 360 . The single column of 9 long lines is bounded by a pair of triple vertical bounding lines, rendered in red pigment, which extend the full height of the extant page. The lines of text subdivide in the center of the column in geometric stepped formation, making space for a decorative stringing hole, albeit omitted. The single column variously of 7 or 6 long lines is bounded by a discreet pair of triple bounding lines, which extend the full height of the extant page. The circular stringing hole (torn on one leaf with an extended ‘tail’ which rises diagonally) is surrounded by a more-or-less circular frame of red pigment. There are multiple densely-compacted and neatly written annotations both in between the lines of text and in all the margins. Damaged at both sides, the leaf has a single column of 3 long lines of ‘text’ comprising diagrams with dotted patterns or script. These lines stand within a rectangular band-like border, edged with ink and filled with red pigment. The border has vertical extensions at the side (only one side survives), which extend the full height of the extant page. The stringing hole comprises a circle with an extended tear. Geometric ink designs embellish the red circle surrounding the stringing hole. The column of 6 long lines of text stands within a bordered rectangular frame comprising a nested series of bands. The broadest band is filled with a pale reddish or orange pigment. 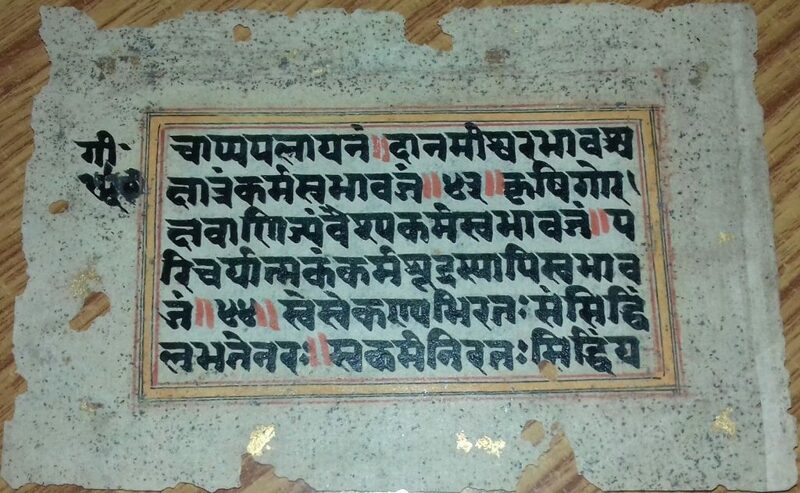 The lines of text alternate in color regularly between red pigment, black ink, and gold leaf laid within ink outlines. The column of text in 6 long lines stands within a bordered rectangular frame comprising a nested series of bands. The broadest band is filled with yellow pigment. Around the frame and partly extending into it, an irregular speckled pattern serves as a decorative background for the margins. Do you have suggestions, corrections, and refinements concerning these pages? We hope to learn more. Please add your Contacts below and/or Contact Us.